Nuance Communications Inc holds a reputation for being behind the virtual assistants for a number of leading industries in the world. Over time, Nuance has been applauded for its excellence in managing and securing documents including the provision of healthcare document management solutions. Additionally, the company has recently unveiled its AI virtual assistant which is created with a specific purpose of providing help for healthcare providers. The newly unveiled Dragon Medical Virtual assistant is aimed at helping to streamline a broad range of clinical workflows for about 500,000 clinicians. This development is designed to improve the interactions between patients and clinicians with the capacity to enhance patient’s experience and reduces the clinician’s workload. Several people already depend upon Dragon Medical every day for their documentation; it was created in the year 2012. This package seeks to offer high-tech conversational dialogues coupled with inbuilt capabilities which helps to automate clinical workflows. This new innovation indeed helps to validate the belief that virtual assistants would radically change healthcare towards the end of the year according to Nuance’s Art of Medicine survey carried out back in the year 2015 of 80% of about 10,000 clinical. A research carried out by professionals from the University of Wisconsin as well as the American Medical Association showed that primary care physicians expend over half of their work hours on computer screens carrying out data entry functions using EHRs. 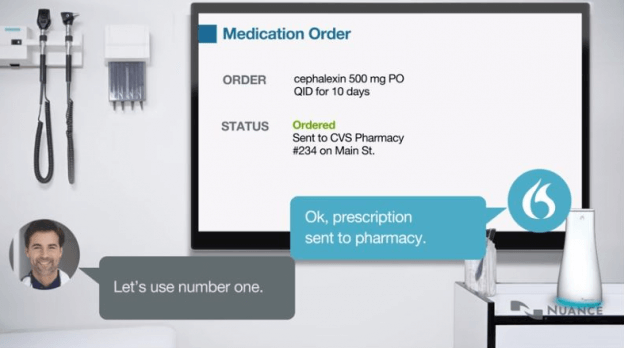 This new innovation will utilize the AI conversational capabilities of Nuance with a view to optimizing the EHR experience of health care providers. This should thus be giving the clinicians enough time to focus on their patients which in turn translates to better healthcare delivery as well as less burden on the physician. What Nuance is seeking to do is to create an environment where the clinicians can have their energies focused on the patients without technology coming in the way. According to Peter Durlach, the healthcare virtual assistant is designed with a view to taking the clinicians back to when they decided to become doctors as well as the reason why they did. This virtual assistant solution by Nuance combines voice biometrics as well as text-to-speech, Voice-recognition technology specially designed for healthcare. This is in addition to smart speakers for healthcare providers as well as an environment that makes use of the HITRUST CSF certified Microsoft Azure cloud hosting system. How can simple tricks fool AI? How does it compare to Amazon’s Alexa? There are quite a number of ways whereby both Amazons Alexa shares some similarities with the dragon medical virtual assistant, for instance, Alexa has a certain voice application known as Amazon Echo which was created by Orbita, which is a voice startup company located in Boston. This company is creating and carrying out tests on health care programs for certain clients. This group consists of those who desire to ensure that patients make use of their medications while they also follow the post-surgical instructions. Also, both technologies seek to ensure that the information collected is actionable. Furthermore, the fact that Alexa comes with over 25,000 skills which were created by third-party developers makes it a very dynamic tool which should easily find greater application in the health sector. It should, however, be noted that not both Alexa and Dragon have their own unique peculiarities with each one having its own unique strong points. For instance, Alexa is able to carry out functions such as read stories to little children, play soothing songs to help sleep at night and it also has the capability to remind you of when you are to take certain medication while the Dragon medical virtual assistant has features like voice recognition technology, voice biometrics, text-to-speech capabilities as well as integrations into all major EHR systems. Both technologies are gaining increased acceptance and popularity as far as their market reach is concerned. The Dragon, for instance, captures and communicates more than 300 million patient’s stories annually and assisting more than 500,000 clinicians in about 10,000 healthcare organizations while for the Alexa over 8.2 million people are currently using the device. Although this figure is estimated to rise in the nearest future. Unlike what is obtainable with traditional healthcare systems which have a reputation for being labour-intensive, recent models of healthcare instead driven by data and knowledge. A number of the newer healthcare models will heavily depend upon a new innovation of real-time big data analytics as user-friendly and artificial intelligence learning tools. There are already a dozen different areas which Artificial Intelligence has found application in the health industry ranging from the assistance in repetitive jobs to the design of treatment plan as well as medication creation and drug creation. According to a report by Reuters, the global powerhouse’s in the artificial intelligence as far as the medical sector is concerned includes; Oncora Medical, Medtronic, General electric company, Google, Intel Corporation, IBM and a whole host of others. However as beautiful as the prospects of these companies may be, they also have their own challenges which range from the prejudices and fears that are associated with Artificial Intelligence. There are fears in some quarters that Artificial Intelligence may grow to a point where it becomes too intelligent and decides to take over the roles and functions of mankind. This, therefore, calls for greater understanding of the benefits of artificial intelligence as well as a strategy to help combat its possible drawbacks. One very big challenge as far as Artificial Intelligence is concerned has to do with regulation. This is especially so owing to the fact that this is one technology that seeks to make use of sensitive healthcare information. This is why there appears to be a strict regulatory framework guiding the operations. This would, however, become more flexible with time as people begin to better appreciate the benefits of this technology especially in the healthcare industry. Based on a market report tagged Artificial Intelligence in Healthcare Market which illustrated a forecast to the year 2022, it indicated that the global AI industry in the health sector is expected to grow to about 8 billion dollars by the year 2022. There is an increase in the usage of big data in the healthcare sector also, there appears to be an imbalance which exists between the workforce and the patients. Also, there is the need to lower the cost of health care in addition to the increased importance of precision medicine as well as an increase in investment in artificial intelligence. These all make case for the expected rise in the value of AI in the health sector globally.